I love sterling silver, but I don’t work with it much because the prices of silver, and all precious metals, has gone up in recent years. It’s just not cost effective for me to keep it on hand, but I definitely take special requests for stamped silver pieces. The other thing about silver is that it tarnishes, and requires regular care to keep it looking nice. Things like chlorinated water, cigarette smoke, certain body lotions and perfumes, and even sweat can accelerate discoloration. The most effective way to keep silver looking shiny is to wash with a mild soap and water, and polish it with a soft cloth. But don’t think you need to save it for a special occasion, tarnish also happens when it’s stored, so wear it often, but make sure you care for it properly, and it will last for years! 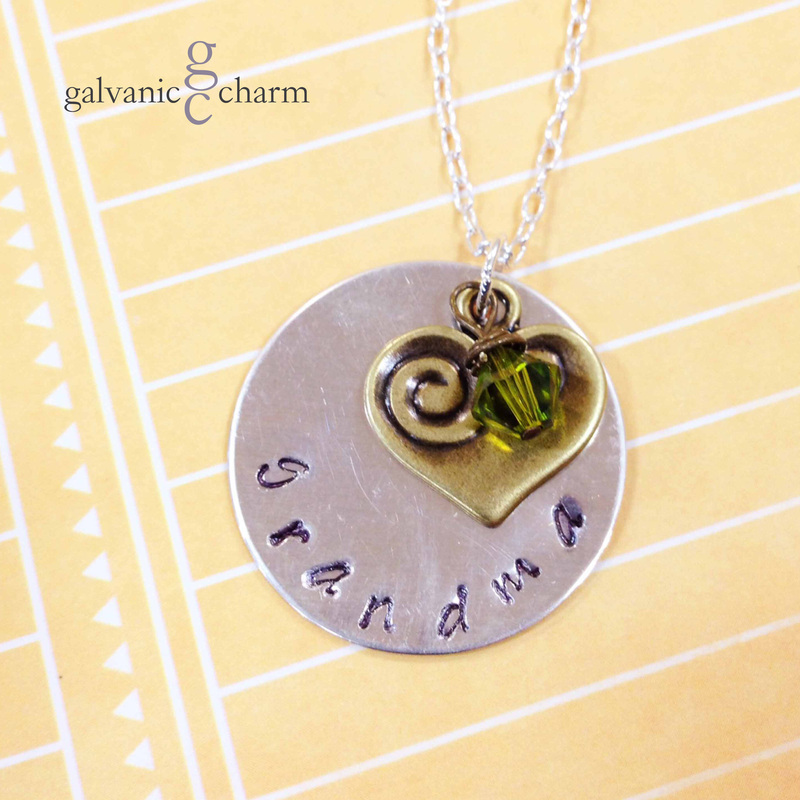 GRANDMA KAT – Grandma’s necklace with a hand-stamped 1″ sterling silver circle, antique brass heart charm, and wire wrapped Swarovski crystal birthstone drop. 18″ silver plated light cable chain. $35 as shown. Available directly or on Etsy.